Zootopia: Crime Files is a hidden object adventure game based on the Disney animated movie Zootropolis. 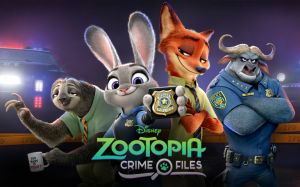 Partner up with ZPD officers Judy Hopps and Nick Wilde and collect clues from scenes to solve crimes. The game is available on Android and iOS. 159Question... for all these viewers?